Hi Friends! I have to tell you just how much I LOVE my Stampin Up Simple letter dies. I have both the numbers and letters (lower case). I love my big shot. It is the go to for out of the box additions to your cards. They are the perfect size for your scrapbook pages so I thought well le me see what I can come up with for a card! I cut the letters using the new Concord Crush cardstock. The purple is so delicious! 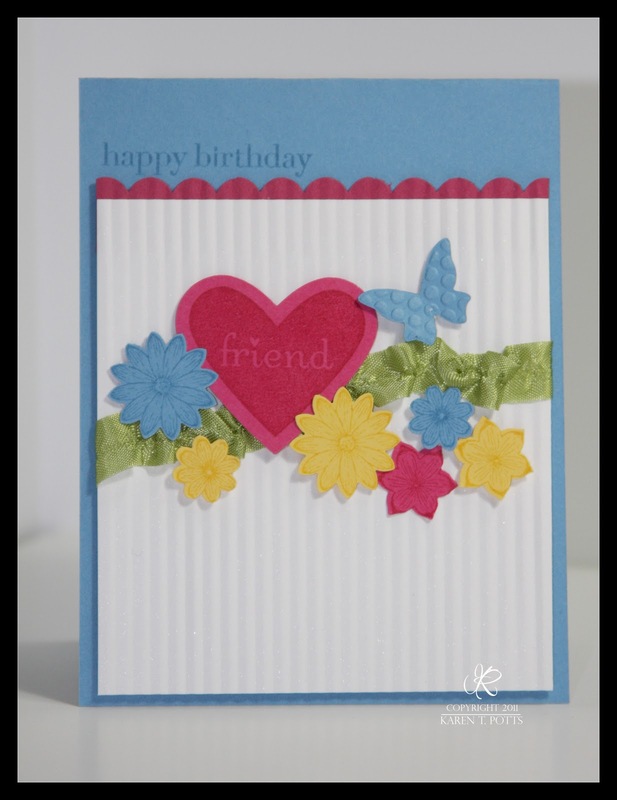 I glued them to the Perfect Polka Dots embossing folder and use the friend heart from the I Heart Hearts set to make a "flower" of sorts. I also tied the pear pizazz ribbon to make the leaves for the flower. I attached the orange using dimensionals. 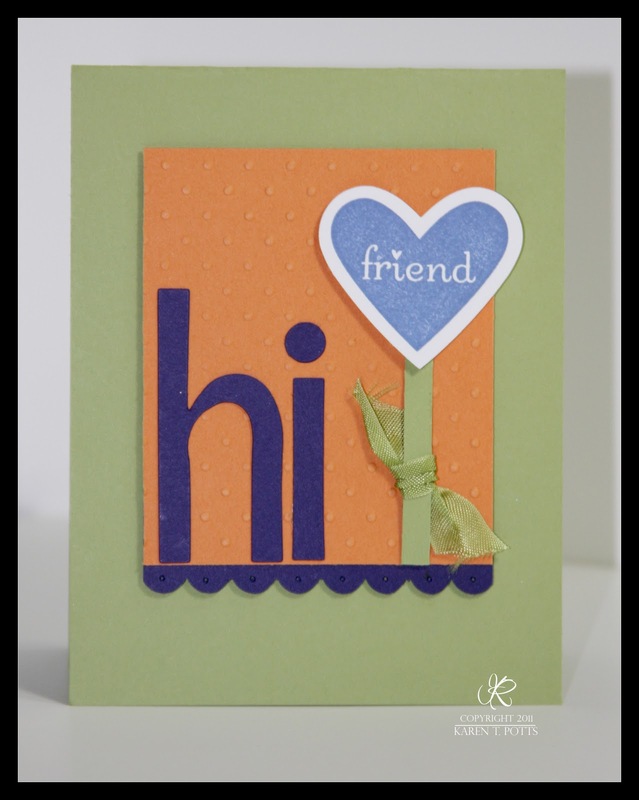 What a cute card to make just to say hello! We are waiting for the storms to come in this evening. I will be up in my craft room welcoming the rain whie making some more creations! Tomorrow is Friday...another busy weekend in the making! See you then! Posted by Karen at 5:09 PM 3 Click here to leave me a comment. Good morning follwers. I hope everyone had a blessed Easter. We ate too much as usual but it was delicious. Todays card was made for a kids birthday. I used the build a monster set. If you have this set, the Stamp-a-ma-jig is a must have! I would have never lined up the eyes and mouth without it! I watercolored the monster in Marina Mist which coordintes beautifully with the Early Espresso. Posted by Karen at 6:36 AM 1 Click here to leave me a comment. TGIF! We have made it to another Friday and Good Friday at that! I will be away for the next few days but I wanted to share my Nugget Candy Box I made for Easter. You can get the tutorial from Sara over at Sarahs Ink Spot. She has some great tutorials. I chose to the the sleeve of my box using acetate so you could see the cute little candies inside the box. I used the eggs from the Nature Walk stamp set for the labels to wrap the candy. One note, if you do choose to use the acetate for the sleeve, or the box, score and crease your lines very well! Practice makes perfect. I hope everyone has a blessed Easter. Posted by Karen at 6:57 AM 0 Click here to leave me a comment. Hello friends. There isn't a better feeling in the world than to know that someone cares. What would we do without family and wonderful friends? I've been busy this week helping someone I care dearly for. They are going through alot right now and I hope today is the start of a new look on life and what it has in store for them. 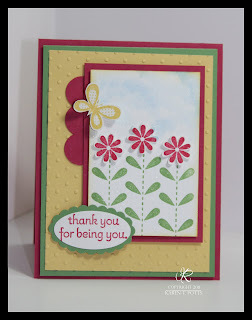 Todays card is Thank You for Caring. Make sure you thank those in your life that are important to you. I used Rick Razzleberry and Pear Pizazz for the base and mat. The edge of the white piece was punched with the spiral punch and watercolor painted the flower. The butterfly is from the Beautiful Wings and the sentiment is from Three Little Words. It's a simple little card but sometimes it's better that way. I will post again when I can. I have lots of new ideas to share! Thank you for caring and visiting my blog! I hope you have a blessed day! Posted by Karen at 6:51 AM 1 Click here to leave me a comment. Hello everyone! Hope you didn't spend all weekend grinding away at your taxes! For once I had mine submitted before the last day and it was a great feeling not to have to worry about it. The IRS is definiately not my friend but since this was a cheery card, I thought I would showcase it today! It's made with avetate and White Staz On ink. The Staz On stamps so nicely on the acetate and dries in just a short time! 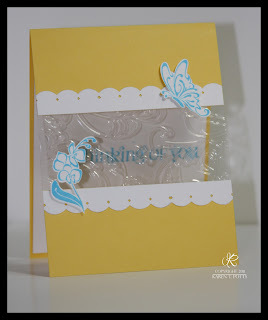 I'm going to try this one again with an outline stamp for a more elegant look. The ribbon came from a birthday present! I always save the ribbons because you never know when it will be a perfect match for one of your projects! 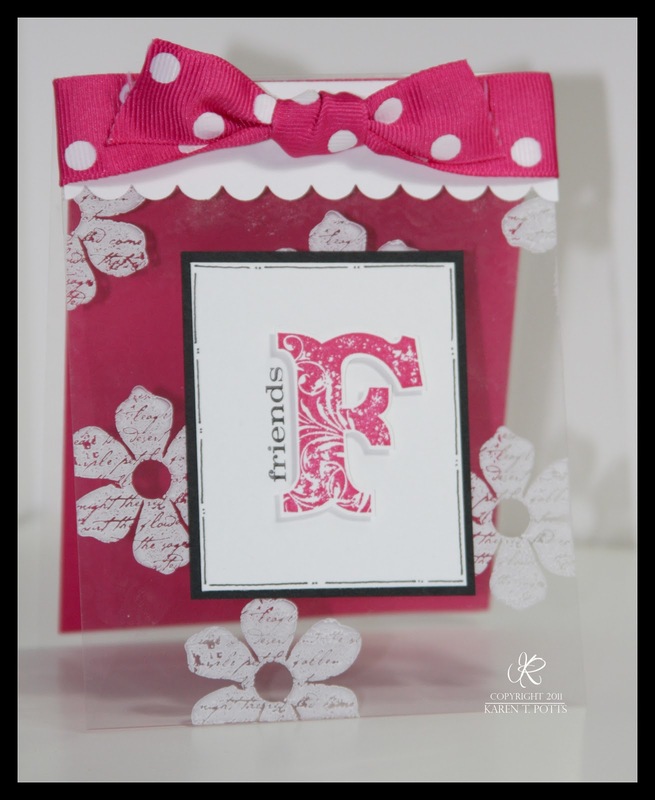 The "F" and Friends are part of the Stampin Up Vintage Vogue stamp set. It has always been an "old faithful" of mine and you can change the look from elegane to whimsical very easily. Posted by Karen at 6:41 AM 1 Click here to leave me a comment. Thank you for Being You - Karen Giron Challenge and Blog Candy Giveaway Winner!!! TGIFeveryone! I hope it goes by fast and we can get on with the weekend! 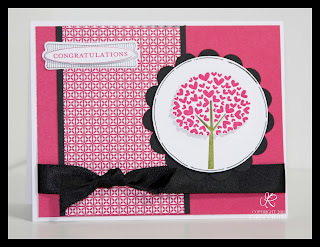 THE BLOG CANDY WINNER - Congratulations goes Jenny from Cards and Crafting! Jenny, please email me your info and I will get your goodies right out to you! It's so exciting to get new stuff to play with...especially when it's FREE! 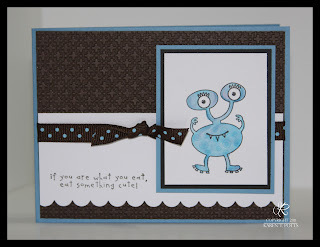 Todays card was made from Karen Giron's Sweet Sunday Sketch Challenge 112 I love this sketch.. There is so much you can do with it and make small changes for a whole different look. I got a little carried away with the layers but I love the way it turned out. I think it was my favorite card I made last week. I started with a Rose Red base and layered Wild Wasabi and So Saffron. 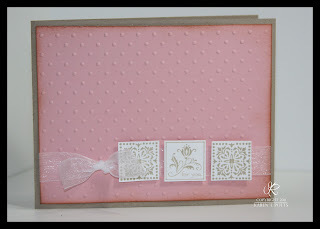 Using the scallop circle I made a template and daubered the clouds iin the background of the shimmery white cardstock. I created the side embellishment using the 3/4" circle punch and layered them down the side. 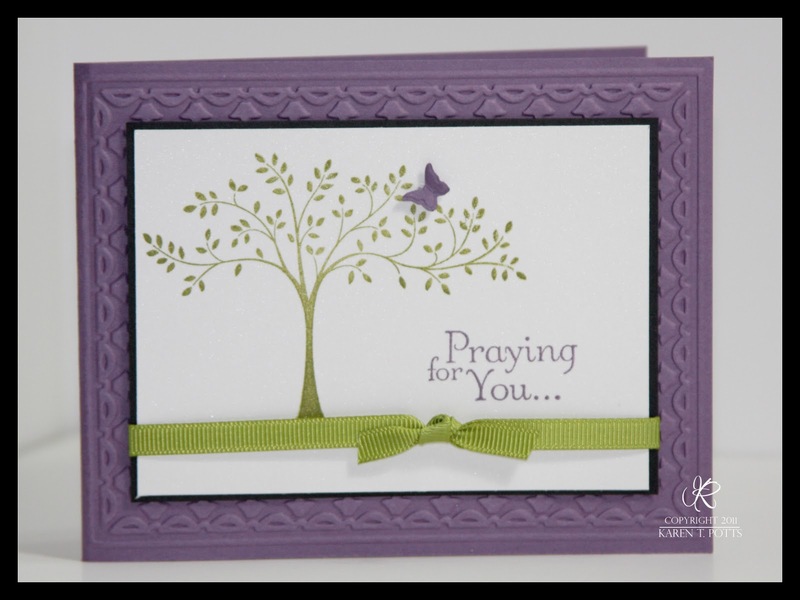 The sentiment is stamped on shimmery white and matted using the scallop oval. For the finishing touch I added the butterfly with a dimensional! Posted by Karen at 7:02 AM 1 Click here to leave me a comment. I have been so excited waiting to share this card with you. I love the look of the embossed acetate. I used the Stampin Up! Elegane Lines embossing folder and ran a scrap through my Big Shot machine. The stamps are from the Thanks for Caring set and I stamped them in Tempting Turquoise. I punched an elegant border to frame the aacetate and used dimensionals to add the flower and butterfly. I also wanted to show you the inside which you see from the front of the card through the acetate. I thought the embossed acetate would take away from seeing the sentiment but it works great! Give it a try, you will love it! Posted by Karen at 6:51 AM 2 Click here to leave me a comment. First off, I would like to thank Photobucket for the total chaos on my blog yesterday. I had to go in and delete the backgound and signature off of the template so the content of the blog could be seen. If anyone knows of a good photo hosting site, please let me know. 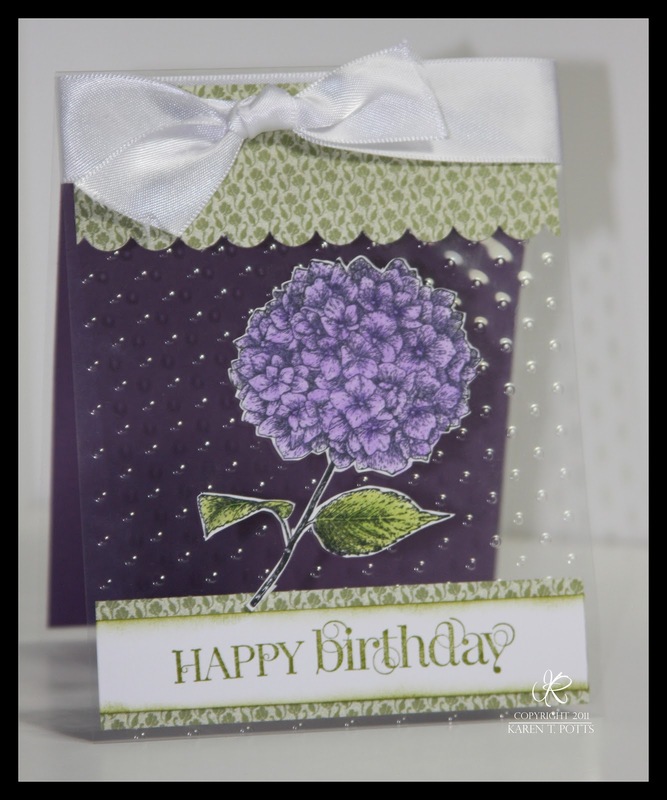 Todays card is made using the beautiful Shimmery White cardstock and the medallion stamp stamped in black. 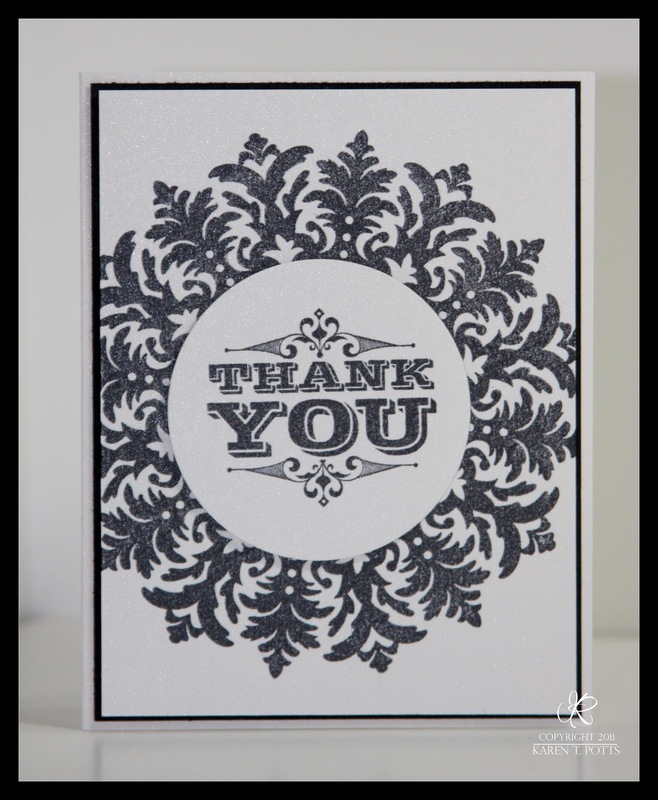 I love the crisp sharp look of the black and white, especially on the shimmery cardstock. 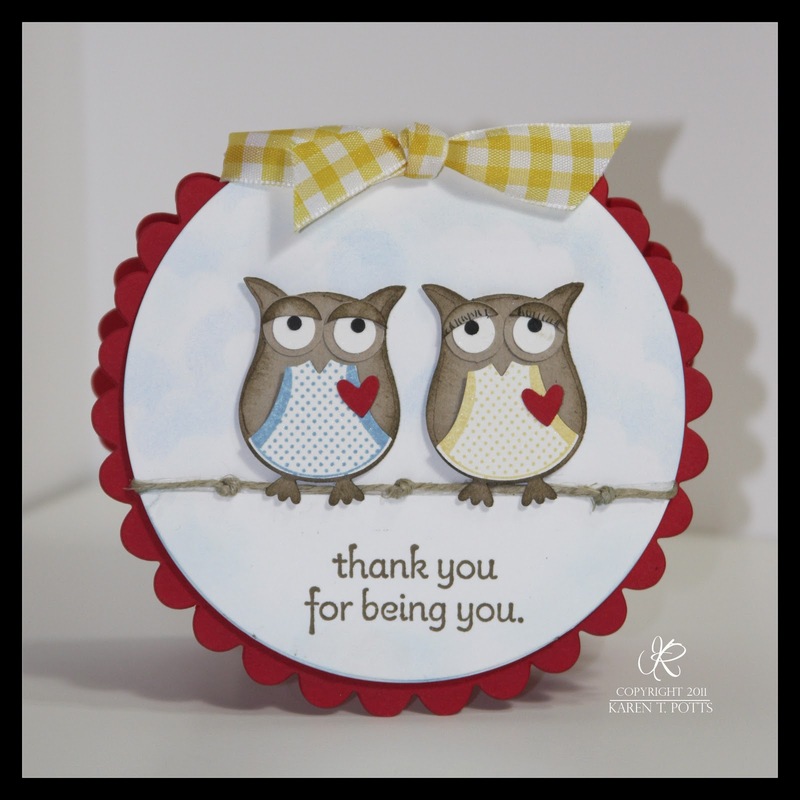 I stamped the "thank you" on a separate piece and cut it into a circle and added it to the card using dimensionals. I matted the shimmery white with a fine line of black to give it an elegant finished look. As always, I love to read your comments and if you have any question, post them and I"ll get back to you! Happy Hump Day! Two more days till the GIVEAWAY. See details here! Posted by Karen at 6:59 AM 2 Click here to leave me a comment. 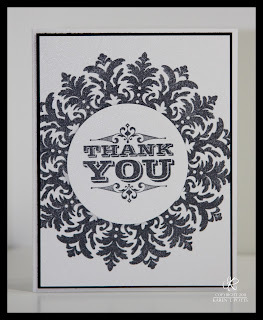 I just love the Stampin Up! Owl punch. This card kit was a leftover from a Christmas card class! I took the leftover kit and challenged myself to make another card using the supplies from the original card. Originally, this was a Christmas tree ornament! The jute was used to hang the card on the tree. I knotted the jute making it the branch for the owls to sit on and attached it to the card. I did have to make the circle larger than the original card and I used the dauber to create the clouds. I love it when a makeover falls into place! Only a couple more days for a chance at blog candy! You can enter below by leaving a comment and signing up to follow me by email, google, or networked blogs. Drawing will be Friday, April 15th. Like my ideas, sign up for emails so you don't miss any! Good morning everyone! Todays card is a simple but elegant one! I used the Cute by the Inch set and stamped the small squares in Crumb Cake, added sheer ribbon and the lots of dots embossing folder for the background. I distressed the edges of the pink and attaeheed to the card base using dimensionals. 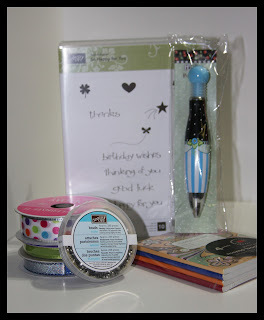 The is still a chance to sign up to win my blog candy. Sign up here. Leave me a comment and follow via the links on the right hand side of my blog. Posted by Karen at 6:37 AM 0 Click here to leave me a comment. Good morning everyone! What a beautiful Saturday we have today! I have been up made my rounds and am now ready to enjoy the sun! Todays card is perfect for todays forecast......bright and beautiful! 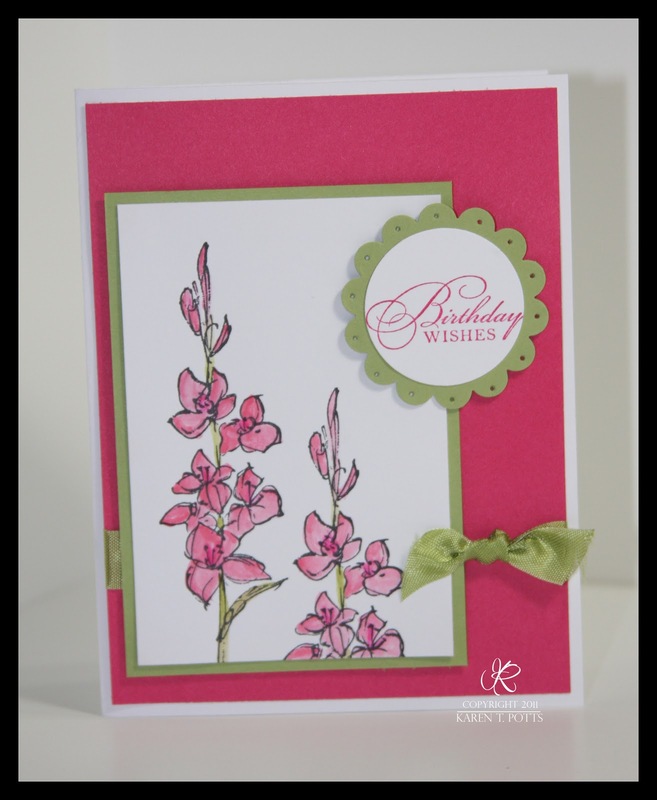 I used the Watercolor Trio and Fast and Fabulous hostess stamp sets and watercolored the flowers with my Aqua pen. It's the perfect technique for these stamps! I used the paper piercer and punched holes around the scallop and attached it with dimensionals. Don't forget to sign up for my blog candy via this link which runs through April 15th. Posted by Karen at 11:08 AM 1 Click here to leave me a comment. 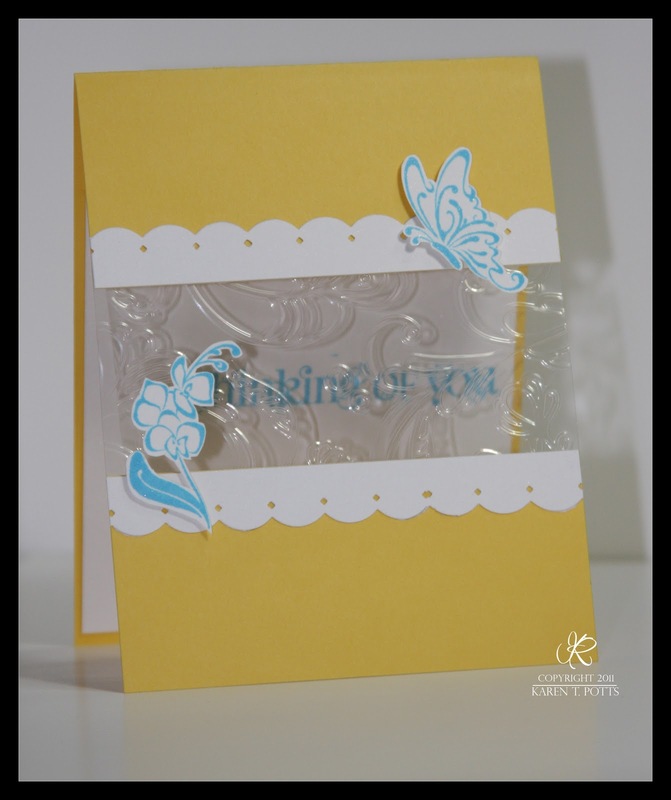 Happy Birthday Embossed Acetate Card / BLOG CANDY GIVEAWAY!!! TGIF! I am so ready for the weekend and it's supposed to be a nice one! I've got some stuff to prepare for a friend but other than that hopefully we will be beach bound and get a little shopping in! Today I am featuring one of my favorite cards. It is made with Embossed Acetate. I ran the top half of the card (acetate) through the Lots of Dots embossing folder and placed a piece of Perfect Plum cardstock on the inside for the base. I colored the flower with the Prismacolor pencils and did lots of shading for the beautiful detail. 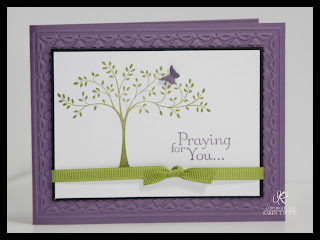 I used the upcoming new Designer Paper for the top of the card and the sentiment mat at the bottom. I think it's just beautiful! You have multiple ways of winning. 1. Leave a comment on this post. 2. Become a follower using one of the sign ups on the right (Email Subscription, Google or Networked Blogs). If you leave a comment and become a follower that doubles your chances to win. 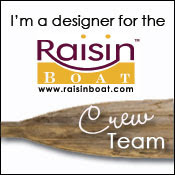 I will be drawing Friday, April 15, 2011 for a winner! 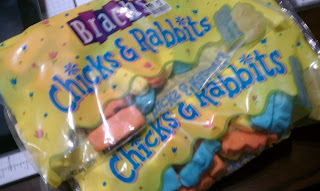 Now, on with the Blog Candy! Have a geat weekend everyone! Posted by Karen at 5:59 AM 14 Click here to leave me a comment. Todays card is created from a sketch over at the Mojo Monday site. 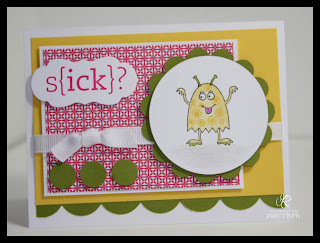 I have had the build a monster set for quite some time and have not used it so I thought it would be perfect to use one of them as a little "virus" and make a get well card. I used my prismacolor pencils to color him and I think he turned out just adorable. When we went to the mailbox yesterday there was a wonderful surprise from my sister, Kathy! It's not Easter without Chicks and Rabbits and there were TWO bags of them. I guess she knew Katie would want her own bag and I couldn't hide them fast enough so I shared! We have looked everywhere in Jacksonville for our favorite easter treats with no success so she hooked us up! Thanks Kathy! Don't forget to stay tuned for my give away that starts tomorrow! Posted by Karen at 6:33 AM 3 Click here to leave me a comment. It's a chilly morning here in Florida. The storm front that came through yesterday brought us back to cooler weather, but knowing Florida, it will be in the 80's again tomorrow. Todays card is made using a card sketch from the Page Maps website. I used the paper crimper (had to dig that out from the very back of my supply closet) to do the shimmery white cardstock. I stamped the flowers and punched them. Once I arranged everything on the page, I added dimensionals to several of the pieces. I pulled a string on the pear pizazz ribbon to gather it and then placed adhesive on my page and attached the ribbon. Check in on Friday as I will be starting a give away that will run through the weekend! If you missed out on a Sale-a-bration set, it may be your lucky day! Posted by Karen at 6:44 AM 5 Click here to leave me a comment. Today's card is made using the Thoughts and Prayers set. I really love this set. I have made a get well card to show you today. I used the tulips embossing folder for the border of the card. It adds a nice bit of elegance to the card. The little butterfly is mad using the Embosslits Beautiful Wings. If you are not familiar with these dies, check them out! They cut and emboss in one step! It's supposed to rain here in Sunny Florida today but that's ok we need it! Enjoy your day! Posted by Karen at 6:16 AM 4 Click here to leave me a comment. Hello friends! I have been out of the loop as of late but starting today I have a huge stack of cards to share with you. I have been playing with new stamp set, new techniques and some new templates which I will share with you over the several weeks! Todays card is made using the Valentine Defined stamp set along with the Perfect Punches for the greeting. I have used Melon Mambo cardstock along with the DP paper in the same color. I stamped the tree in Old Olive and then stamped it again in Melon Mambo and cut out the hearts and used dimensionals to adhere. For the greeting I punched in black and Melon Mambo and added dimensionals to the congratulations. I can't wait to show you what I have in store for tomorrow. Make sure you hit the "follow" button on the side bar so you don't miss a creation! I will be hosting a giveaway over the next weekend so stay tuned for that also! Posted by Karen at 7:15 AM 7 Click here to leave me a comment.